Sometimes you need to display HTML or an iframe on your dashboard. This article will show you how to do that. Log in to your Grow account and click Add Metric. Choose your data source, and connect your data. Note: if you plan on simply entering an HTML URL, it does not matter what data source you choose. Click Column to reveal the chart type menu, then select HTML. 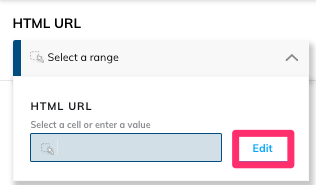 You can enter the URL where your HTML is stored, select the cell in your data where your URL is stored. Name your metric and click Save. And that's it!